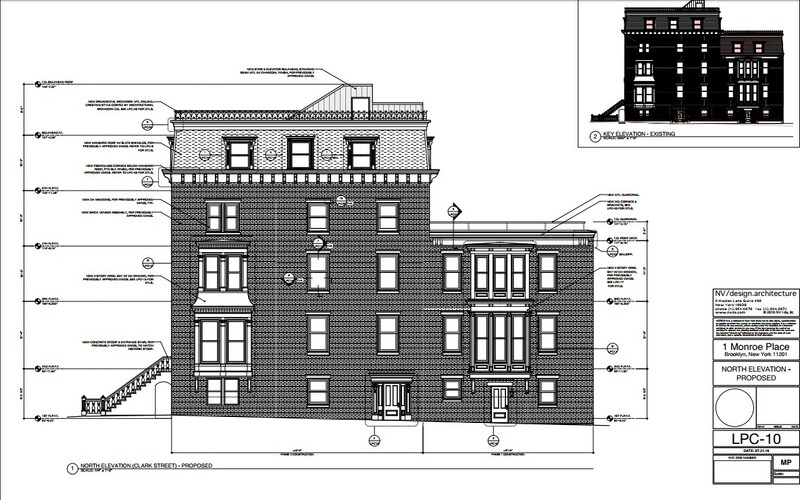 Landmarks Preservation Commission approves reconstruction plan for Brooklyn Heights eyesore 100 Clark St.
On Tuesday, the city Landmarks Preservation Commission (LPC) approved a reconstruction plan for one of the Brooklyn Heights Historic District’s rare eyesores, 100 Clark St., which has been sitting half-demolished since 2008. If this news sounds familiar, it’s because the preservation agency approved a very similar restoration plan for the once-beautiful residential property back in 2011. But the rebuilding project never got underway — and the LPC permit expired. So architect Tom van den Bout of NV/design.architecture had to take a new plan to the commission, which gave it a unanimous thumbs-up vote. 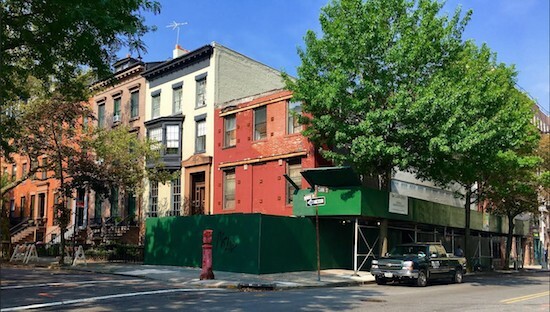 “The whole neighborhood welcomes such a moment when we can restore this house,” Commissioner Frederick Bland, a Brooklyn Heights resident, said prior to the vote at the LPC’s Lower Manhattan headquarters. The current owner, Newcastle Realty Services, bought the property through an LLC for $1.25 million in 2010, city Finance Department records indicate. 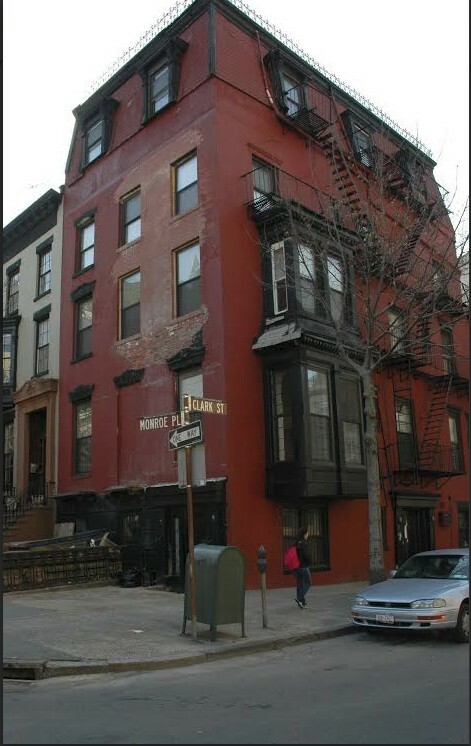 After Tuesday’s vote, Margaret Streicker Porres, the real estate investment and development firm’s founder and president, told the Brooklyn Eagle there will be rental apartments, not condos, in the restored building. The Greek Revival-style house, which is also known as 1 Monroe Place, was built in 1852 and later had a mansard roof added to it. The property is situated on the corner of Monroe Place, an aristocratic street just one block long that is lined with soignés pre-Civil War homes. Nearby 27 Monroe Place, a restored 25-foot-wide townhouse built in the 1840s, is for sale at an asking price of $18 million. The Corcoran Group is the listing broker. Previous owners of 100 Clark allowed the property, which was being used as an 18-unit apartment building, to fall into disrepair. 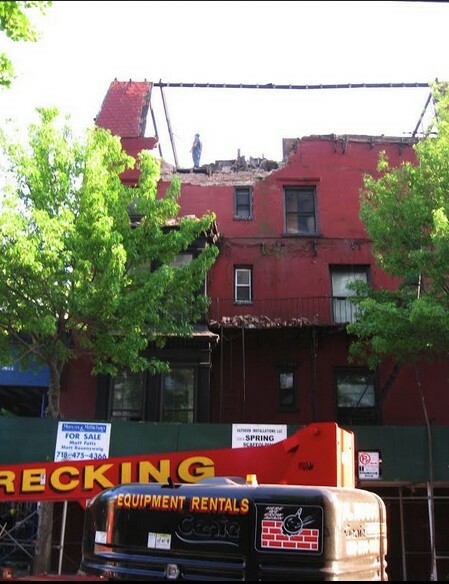 The city Buildings Department deemed it dangerous — and on Memorial Day weekend in 2008, sent a wrecking crew to tear it down. The emergency demolition was half-completed when the Penson Cos., which owned 100 Clark at that time, went to court and got it stopped. At a public hearing before Tuesday’s vote, Judy Stanton testified on behalf of the Brooklyn Heights Association. She called 100 Clark an “eyesore” and a “wreck” and expressed the group’s support for the rebuilding plan. The newly approved plan calls for the reconstruction of the missing top of the building. The portion of the property facing Monroe Place will be five stories tall. The back of the house will be three stories tall. A front stoop will be built to replicate one that’s long gone. A mansard roof with slate shingles and an ornamental ironwork railing will be constructed on the five-story section of the property. The three-story section will be topped by a roof terrace. An elevator will be installed.